The Chinese giant salamander is the largest salamander species in the world. Adults can grow up to 5.5 feet in length but some can be as small as 1.17 feet. 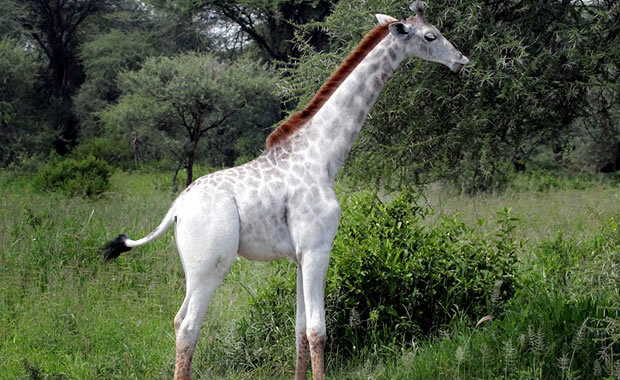 The skin is smooth and thick with black blotches and the main coloration varies from dark brown or black to green with lighter underparts. Its four limbs are short and the tail is usually half its body length. Although this species is totally aquatic, only the larvae have gills which are lost very early in development. 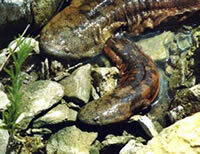 After the giant salamander loses its gills, it is able to breathe through pores and wrinkles in the skin. Giant salamanders have poor vision because their eyes are very small and positioned on the top of their flat heads. This species can be found in cold, fast moving mountain streams where caves and rock moulds are present. They are mainly nocturnal, preferring to hunt at night. Since they have poor vision, they use sensory nodes on their heads and skin to feel the different water pressures as potential prey moves by. Prey is caught by snapping it with the side of the mouth. Diet consists of crabs, shrimps, aquatic insects, fish, and frogs. These salamanders travel upstream to breed in the months of August and September. The males compete viciously until one male is established as the "den master." The den master is then in charge of overseeing the mating area, allowing females and other males in to spawn. After the eggs are fertilized, the den master guards the eggs for six months. The eggs develop into larvae and are known to hunt and feed in groups rather than individually. Giant salamanders are known to live up to 80 years. Giant salamanders are threatened mainly by pollution and habitat disturbance/alterance (such as the building of river dams which disrupt the flow of the water where the species is found). They are also illegally hunted for their flesh, which is a delicacy in Asia, and some are caught and sold in the pet trade. The species is protected from international trade, and a protected area was created in Mount Wuyi, China to preserve the species. Copyright Notice: This article is licensed under the GNU Free Documentation License. It uses material from the Wikipedia article "Chinese giant salamander". Glenn, C. R. 2006. "Earth's Endangered Creatures - Chinese Giant Salamander Facts" (Online). Accessed 4/23/2019 at http://earthsendangered.com/profile.asp?sp=413&ID=3. Need more Chinese Giant Salamander facts?